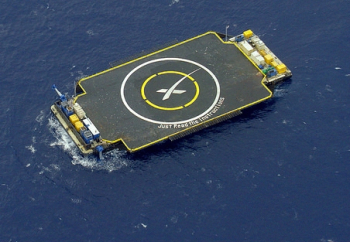 SpaceX’s aspirations towards recovering launched Falcon 9 first stages are continuing to focus on ocean based landings, ahead of realizing the goal of returning the cores back to land. With continual refinements to the approach, SpaceX have welcomed new and improved Autonomous Spaceport Drone Ships (ASDS), one of which has been sighted taking a cruise down the Panama Canal. 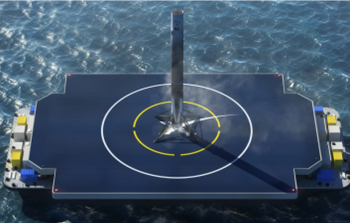 In November 2014, Elon Musk confirmed reports of SpaceX’s “Autonomous Spaceport Drone Ship (ASDS)” – providing an overhead photo of a 300-foot-long ocean-going barge with a deck widened with steel “wing” extensions to a span of 170 feet. 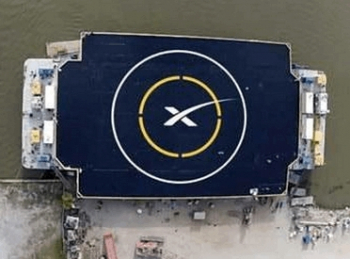 The barge sported a large white “X” logo in the center of two giant concentric circles, marking the spot at which Musk hoped the first stage of a SpaceX Falcon 9 v1.1 rocket would soon touch down during an ocean landing somewhere off the east coast of Florida. Mr. Musk’s “drone ship” photo was the first visible evidence that SpaceX was serious about attempting to recover a launched first stage. Earlier that year SpaceX had filed with the U.S. Patent and Trademark Office requesting a review of rival company Blue Origin’s patent for a method of landing a rocket stage at sea. SpaceX claimed that the Blue Origin patent should not have been granted, since similar methods had been described by other inventors long before Blue Origin filed for their patent. Evidently SpaceX had confidence it would prevail in the patent dispute, since the “drone ship” was unveiled to the public mere months after filing for the patent review, and long before a decision could be expected from the Patent Office – which later announced in March that SpaceX’s dispute had enough merit to go forward in a review process which is now ongoing but may not be resolved until 2016. Mr. Musk presented his company’s first drone ship as using thrusters repurposed from deep-sea oil rigs, able to hold its position at sea to within three meters even in a storm, and perhaps able to allow future refueling and fly-back of the rocket stage to its launch site. Soon after, photos appeared showing the drone ship en route to her new home port in Jacksonville, Florida. Despite its fanciful name, the drone ship was built on a rather mundane barge. The Marmac 300 had been a maritime workhorse for over 15 years, doing drudgery for its owner McDonough Marine Service that included being submerged beneath the keels of sunken vessels and then refloated to effect their recovery. Now, in addition to wing extensions, Marmac 300 carried four diesel-powered hydraulically-driven thrusters for position-keeping, diesel fuel tanks and several large steel shipping containers at either end of the deck housing communications gear, an autonomous guidance system and additional equipment. 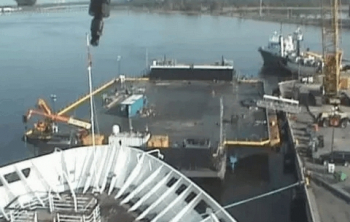 The drone ship was towed to her new home in the port of Jacksonville, to the north of the Cape Canaveral, probably relating to a decision to minimize her travel distance to the landing zone on rocket recovery missions, since Falcon 9 flights typically travel north-east from Cape Canaveral out over the Atlantic. The winged Marmac 300 got her first chance to catch a Falcon 9 stage in January of this year, during the CRS-5 resupply mission to the International Space Station. Unfortunately, the incoming stage ran out of the hydraulic fluid needed for operation of the aerodynamic “grid fins” used for precision guidance, and the stage crashed into the drone ship and was destroyed. 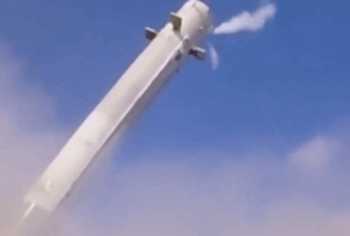 However, rather than downplay the mishap, SpaceX released spectacular video footage of the event and vowed to try again with extra hydraulic fluid. Also, the ASDS proved herself up to the challenge, sustaining only minor damage. Afterwards, Mr. Musk noted she was being repaired and that she would be given the fanciful new name “Just Read the Instructions,” after a fictional spaceship commanded by an artificial intelligence in the Iain M. Banks novel “The Player of Games”. On this first recovery attempt, SpaceX demonstrated what would become more or less their standard operating procedure. The drone ship left port several days before the schedule launch attempt, towed by a dedicated tugboat named Elsbeth III. Shortly after, the support ship “GO Quest” left port to join the convoy. Once at – or near – the landing zone, Elsbeth III’s crew would presumably start up the drone ship thrusters and set her free to auto-position herself at pre-programmed GPS coordinates. Elsbeth III and GO Quest – which appears to carry a large satellite dish on deck – would then stand off at a safe distance during the landing attempt. The drone ship was fitted with deluge water jets that flooded the deck with ballast water from the barge’s tanks, for cooling the deck from the blast of the landing rocket engines. Some time before the incoming stage was expected, the water pumps would be started and the deck flooded. Some of the on-deck photos later provided by SpaceX showed water jets flooding the deck as the incoming stage came into view. During the landing attempt, the drone ship was transmitting video back to SpaceX launch control facilities for real-time visual monitoring of the landing. It appeared during SpaceX’s webcast of this and later recovery attempts that SpaceX mission control personnel were seen to be watching a near-real-time video feed from the drone ship, based on their reactions as they watched their monitors, and based on Musk’s tweets shortly after the fact with details that suggested he had seen the event. No crew were on board the drone ship during the attempt, hence the “autonomous” label. Hans Koenigsmann, SpaceX’s Vice President for Mission Assurance, said in a press conference before the CRS-5 mission that it would take about one to two hours after a landing for the crew to safe the stage remotely before boarding the drone ship. Remote-controlled safing activities would likely include venting pressurized helium from the fuel tank and venting residual LOX. Once the crew had boarded the drone ship, the stage would be secured for transport. Although Musk has said the stage would be stable because of the weight of its engines and their support structure at the aft end of the stage, he has mentioned that steel “shoes” might be welded to the deck over the feet of the stage’s legs for added insurance. There have also been mentions of chains attached between the deck and the aft of the stage. Once back in port, the stage would be offloaded by crane, further safed – fuel drained, etc – placed on a “breakover” fixture to rotate it horizontal, then loaded onto a truck and transported by road to either SpaceX’s facilities in McGregor, Texas or SpaceX’s Spaceport America base in New Mexico for additional inspections and testing. Following CRS-5, the drone ship’s next recovery mission came in February with the launch of the DSCOVR spacecraft for NASA. Unfortunately, heavy weather at sea knocked out one of the four thrusters and SpaceX reported that 3-story waves were breaking over the deck. 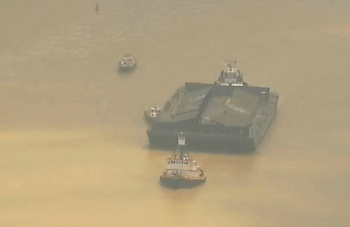 The company called off the landing attempt on the drone ship, and “Just Read the Instructions” returned to port with visible damage to on-deck equipment apparently caused by wave impact. Soon after, Mr. Musk reported that he planned significant upgrades to the drone ship so that it could handle “literally anything” in the future. As a result, the drone ship was subsequently fitted with a vertical steel bow wall and two more powerful bow thrusters. 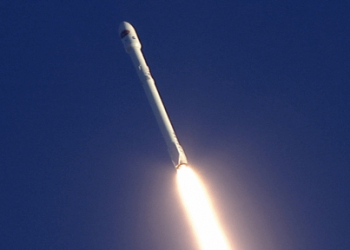 Marmac 300 got her last shot at glory during the CRS-6 ISS resupply mission in April, but was once again thwarted by a wobbly landing of the Falcon 9 first stage, which touched down on deck but couldn’t keep itself upright and toppled over – rupturing its propellant tanks in dramatic fashion. However, SpaceX had made progress, as the stage did not run out of hydraulic fluid this time and appeared oh-so-close to sticking its landing. SpaceX also introduced a new innovation in making a video of the event, using a camera-equipped flying drone to launch itself from the ASDS, hover at a distance, take video of the landing attempt, and return to the ASDS. 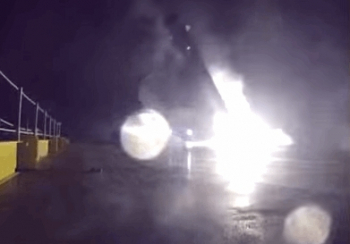 Despite the temporary conflagration caused by the stage impact, the flying drone was able to return and land on the ASDS, allowing SpaceX to later recover the data card from the camera and publish the dramatic video. 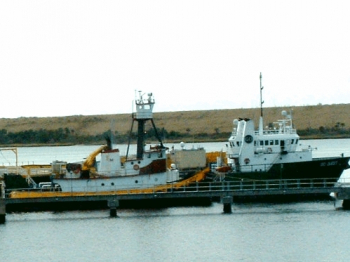 Shortly after the abortive CRS-6 attempt the drone ship was towed back to the shipyard where she had been outfitted in Morgan City, Louisiana. In June, a new drone ship built on McDonough’s Marmac 304 barge appeared in Jacksonville as her replacement. While SpaceX has not said why Marmac 300 was retired, she may have served as a prototype not intended for long-term service. Marmac 304 is a much newer barge that has not seen heavy prior use, and may be considered to have a longer life ahead of her. The new drone ship built from Marmac 304 reported for duty at Jacksonville in early June, albeit in unfinished condition. With dimensions virtually identical to Marmac 300, she carries some new features, including a steel blast wall erected between the rear containers and the landing deck, in addition to the steel bow wall as previously seen on Marmac 300. Ongoing work visible on deck suggests that a second blast wall may be installed at the forward end of the landing deck as well. These – and other preparations – are expected to render Marmac 304 operable in time for the upcoming CRS-7 mission to resupply the Space Station in late June. Shortly after Marmac 304 headed east from Louisiana, her sister barge Marmac 303 left the same port and went south for the Panama Canal. Carrying the wing extensions reportedly clipped from Marmac 300, Marmac 303 reached the Panama Canal on June 9 and began her transit June 14, exiting the Canal on the 15th. Since the wing extensions – if attached – would make the barge too wide to transit the canal when attached, they were laid on her deck in sections as cargo and will be attached permanently when she reaches California in about three weeks. Towing Marmac 303 is the tugboat Rhea, sister ship to the tug Elsbeth III which tends to Marmac 304. 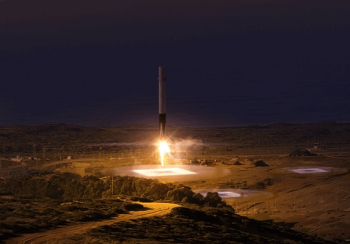 After being fitted with her wings and readied for service, she will go to work catching Falcon 9 first stages from SpaceX’s launch pad at Vandenberg Air Force Base. Although no announcement has been made of her expected operational date, the upcoming Jason-3 mission from Vandenberg would be her first opportunity to attempt a stage recovery. 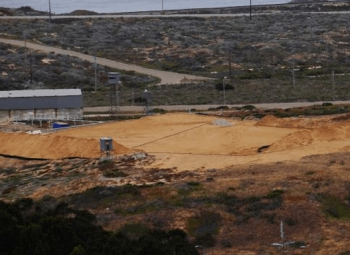 SpaceX has said they hoped to be permitted to attempt a return-to-launch-site landing of the first stage at Vandenberg, but to date it appears that permission may not yet have been granted, and the landing pad that would be used for such an attempt at SLC-4W was shown in a recent photo to consist only of graded earth with the concrete pad not yet poured. According to Musk, the west coast drone ship will be dubbed “Of Course I Still Love You,” after another fictional spaceship from the mind of science fiction writer Iain M. Banks. 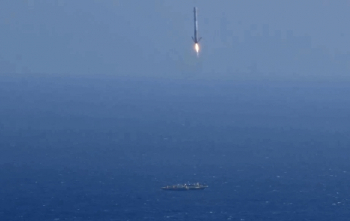 The drone ship is apparently a mandatory stepping stone in SpaceX’s ultimate goal of having Falcon 9 first stages return themselves after launch with a “boostback” maneuver to the launch site, for a soft landing on terra firma. SpaceX is now building landing facilities at both Cape Canaveral (LC-13) and Vandenberg Air Force Base (SLC-4W). According to Mr. Musk, officials have asked for “repeated, successful” demonstrations of a first stage landing on the drone ship before a landing attempt will be allowed at the Cape. SpaceX is also building a new company-owned launch facility near Brownsville, Texas, for commercial satellite launches over the Gulf of Mexico. The Texas launch facility would be SpaceX’s third orbital launch facility and yet another potential base for drone ship operations. Even after Falcon 9 first stages begin landing at launch sites, there may be continued opportunities for downrange landings on drone ships. 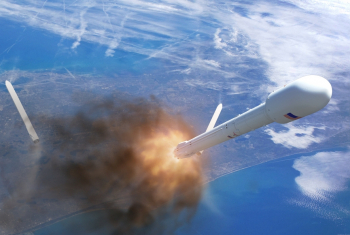 Some higher-energy missions and heavier payloads would prevent the first stage from reserving enough propellant to boost itself back to the launch site, making downrange landing on a drone ship the only option for recovery. Also, the drone ships may also be called on to recover stages from SpaceX’s next launch vehicle, the Falcon Heavy, which will have a central core flanked by two side boosters. Both side boosters and the first stage of the vehicle’s core will be designed for autonomous landing, and Mr. Musk has said there may be missions in which the boosters fly back to the launch site but the first stage of the core lands downrange on a drone ship. In his first “drone ship” tweet, Mr. Musk held out the tantalizing possibility that the drone ships would eventually allow recovered stages to be refueled, launched from the deck, and fly themselves home. 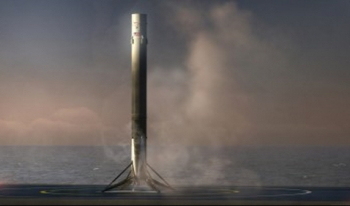 Time will tell if SpaceX can make this dream a reality. In the meantime, it seems increasingly likely that the company could pull off a successful landing of a Falcon 9 first stage on a drone ship soon, perhaps as early as this month.